OK, folks, I have been trying off and on for a year now to add an picture to my profile, but with no success. I am starting with a high resolution picture of my dog (very endearing, I must tell you), and by the time I get it to the required pixel resolution and overall 6 kilobyte or so picture size, it no longer even looks like a dog. What could I be doing wrong? I have read all the instructions on adjusting pixel size and resolution and such using online tools, but again, when I finally get it to conform to ARF requirements, it looks like %$#*&... It looks good down to about 10 kbytes, but once you go below that, the picture just pixelates and falls apart. Perhaps I am starting with too high an initial resolution (the original file was probably 15 Mbytes or so)? I've tried about a dozen times with no success. An ideas? Could I PM the picture to someone and they would send me back a file that would work (bless their souls, payment not included, of course)? Are you saving in a compressible file format like jpeg? BMP and GIF are much harder to shrink. What program are you using? Maybe you can set the jpeg compression settings. Here are three compressions of the same jpeg of 100 x 79 pixels. The first is 100% compression, second is 50% and the third is 20%. File sizes are 461 Bytes, 1.66 KB, and 2.54 KB, respectively. EDIT: For picture shrinking, I'm using both online tools and the native software on my Mac (Preview or Adobe). Is that small enough to be used as an avatar here? Or maybe this one (3.80KB)? Last edited by wiscojim on Jan Thu 10, 2019 5:45 am, edited 1 time in total. Pixel count is fine, but it needs to be less than 6.25K. I got the same thing in my version of MS Paint, 12 KB, and I see no way to compress it using MS Paint. Old Rad Lab, I just compressed it in Paintshop Pro 5.0 and this copy is only 3.29 KB. Just save this photo and you should be good to go. Pixel count is fine, but it needs to be less than 6.25K. I got the same thing in my version of MS Paint, 12 KB, and I see no way to compress it. I just added another smaller one to my post above. I used the previous one, opened it in MSPhotoEditor and saved it as a .jpg at a quality factor of 83. Macrohenry and Wisconsin Jim, you are The Man! Or in this case, The Men! As you can see, the immortal Spencer The Wonder Dog lives on through my avatar. Good dog, that Spencer, but 14 years was a lot for a 100 lb Chocolate Lab, so he's gone to the great boneyard in the sky... Plenty of tube radios up there, I'm pretty sure. And bones. My trusty Photoshop 2.5 ca. 1993 would always report an 8kb file size no matter the compression level, so I think that may be caused in part by the minimum sector size of my hard drive. Even my own avatar at 66x80 (5.28k pixels) reports as taking 8kb disk space. Jpeg compression relies on similar colors or patterns, there's not all that much redundant data in your dog's pic that meets that criteria. Just doing the math of 100x100 nets a 10k pixel count. A 79x79 image would be 6241. I thought it would be a cake walk, but it took going to a smaller pixel dimension for Photoshop to nudge file size down, near as I can determine due to the HD sector size issue. Last edited by Ed in SoDak on Jan Thu 10, 2019 7:09 am, edited 1 time in total. Looks like Mr. Dog has his high beams on. All the better to peer into dark spaces of old radios...! My trusty Photoshop 2.5 ca. Wow, you still use this version? 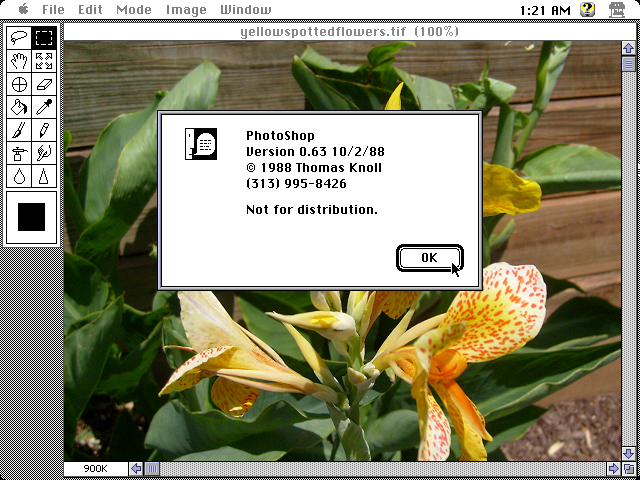 I started with Photoshop 3.0 back in 1996 running on Windows 3.1. Cool. I have PS 7 and can use about 5-10% of it efficiently. But I do like it. You would say that i'm a late starter. I did not own a computer or even use one regularly until February 1996. I'll make my umpteenth plug for Thumbsplus 7 for picture editing. It' s free and easy to use. I didn't own or use one until 2009! He wound up being a system engineer all through the early MacIntosh evolution. Spencer was a fine looking friend, sorry for your loss of him.